Here i m introducing one more app to earn free recharge easily. You can redeem it to recharge. As soon as your friend register via your link u will get 10 Rs. Balance in the app. What is "Bikedekho" app ? 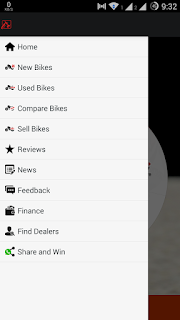 Bikedekho app is very useful app to those who are looking for new as well as used bikes for themselves. Also, u can sell bike and compare bikes also. The app has rewarding system of recharge as i have mentioned above. so follow very simple below steps to get free recharge. 2. Click on menu situated in top left corner of the app. 3. Click on "SHARE AND EARN"
5. When u reach a minimum amount of 50 Rs. U can redeem as recharge.